They say, "like mother, like daughter". I put this to the test by borrowing my mother's glamorous sequin jacket. This thing is probably from the early 90's and has been collecting dust in her closet for years. I remember she would wear it to her fancy New Year's Eve parties and look like a pretty ball of light. When I was younger I was not a fan of the loud sequins and bold shoulders, but since this style is mega popular right now I had to ask her if I could try her version. I felt bold and confident wearing this. This jacket is not for the timid; it calls for attention. I have to admit that I kind of liked it. However, I don't think I will be taking it from her. Is there a blast from the past that you are itching to try? How fab is that jacket! Yeah I totally want all my mums clothing from back in the day, but she got rid of it all! Gutted, ha! This is one magnificent look darling ! I can't over sequins these days..they make anything look uber glamorous..
NICE! very very suuuper nice! now ive used all my superlatives. hahaha! i just love that shiny golden blazer of yours. I want it. lady you are amazing. I love all am seeing here. Great blog. These photos are so pretty! Ohhh the sequins are gorgeous. OMG! I love your sequin jacket! i adore your gold sequin jacket its stunning, and i love how its been passed down from your mum too! Such an intense little jacket! It's pretty cute! I wish I had the legs for super short mod mini skirts! You look great in the sparkly jacket! I was never really into sequins as well but I just bought a white sequin dress today, how unlike me!! Oopsie ! So sorry for being behind on posts here:) Ahhhhh adding you to my blogroll right now. I'm really loving those flare flutter sleeves tops now. So beautiful . Gorgeous jacket, darling! You look lovely! You should definatly keep it. Isn't it amusing when mom has treasures in her closet awaiting for you to take? I love the dresses from the 1930s and 40s, but I don't feel like I can pull them off. Too costumey for me. I love this. How lucky you are that your mom had this in her closet! Aw, your mom must love seeing you in her jacket! It's nice that flash is big right now. It's a bold look but so fun. I would love one day to try a birdcage veil. It's very costumey but very 1930s which is one of my most favourite decades for style! Cute outfit!! I love the sequin jacket. Don't let Rachel Zoe see that thing - she'll steal it! Vintage AND sequined? OMG. 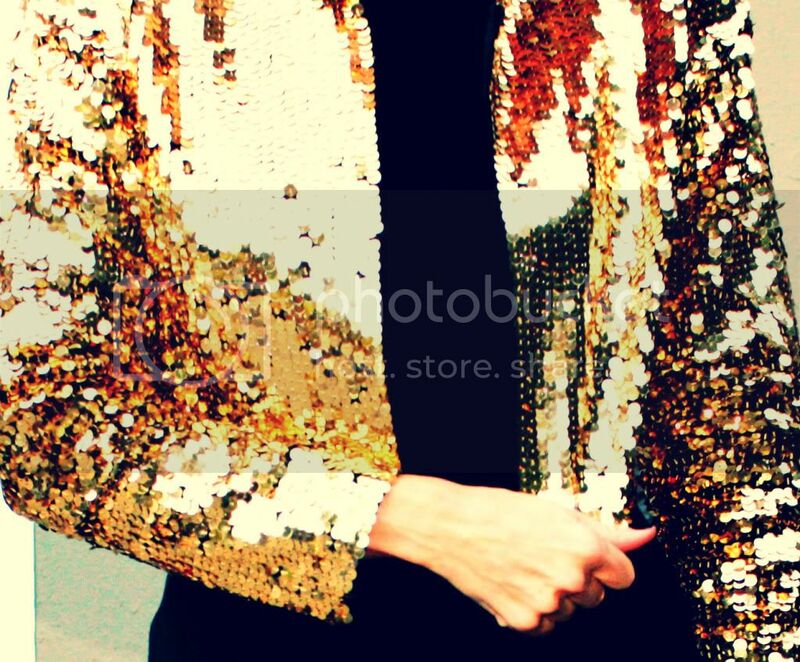 As she likes to say: "I love me some sequin..."
Ooh, ooh, ooh...new layout that I love and vintage jacket that I adore! That jacket is amazing! I love it. Ahh... this jacket is truly splendid on you... bold and you wear it effortlessly. I feel like everyday there is a "blast from the past" moment with fashion choices and what my eye is drawn too. Been in an "Annie Hall" moment recently... trousers and bowler hats... sequins too... 70's always. Thanks for checking out our blog lovely... yours is gorgeous... Going to link you so we can visit often. that jacket is perfection. i'd have to say, like you sequins are my weakness. i just love 'em. it brightens up even the most simplistic outfits. Like mother, like daughter: in this case, what a compliment! My mother kept nothing from those decadent decades! Le sigh! The gilded jacket looks supremely fabulous on you. Oh, I love your hair back like that! Very pretty. adding beautiful bling to basic black. fab! Another wonderful outfit, my dear! i think it's official - you cannot go wrong with a sequinned blazer! as for blast from the past - I wish polka dot leggings and bum bags were cool again. no, really.!! Your sequin jacket is just amazing! Love it. Just the right touch of Dynasty and even better with a story. I'm so glad you brought that beauty out where it belongs. So gorg! This reminds me of the sequins jacket that Gucci did for F/W 2009. Gold sequins is so refreshing after the latest sea of black ones! You look fantastic! I Love Love Love this jacket, its really amazing. You are so right its a little bold and am sure you got a lot of looks but somethings are just worth it. Awesome! So pretty! I love the sequin jacket, I have a blue one that is somewhat similar. SO awesome. your mom is the coolest. this is so glamourous, very handy to have a cool mother's wardrobe! Your mom is a much better dresser than my mother. My mother's hand me down clothes are basically Contempo Casual cheapos that are all stretched out and dingy. MOM, WHERE'S MY AWESOME GOLD SEQUINED BLAZER, HUH? dang girl. I. am. dying. seriously you must steal from your mom's closet! did you not love it? I think it looks killer on you! You are someone who can completely pull off the bold sequin look. think how much fun this would be to wear circa christmas and new years time! I am in love with it. I'm thinking when I am home next month I am going to go raid my mom's closet for little gems like this. I totally remember her wearing things exactly like that to her parties, and thinking "I want that!". like mother, like daughter. for sure. this look is GORGEOUS. wow I love that sequined jacket, just love it. i love it!!! Its so crazy gorg! That jacket is pretty fabulous! That would be perfect for holiday parties!